Wright Asphalt provides innovative, top-quality tire rubber modified hot mix binders. In addition to adhering to SHRP standards, our tire rubber modified hot mix binders incorporate physical and rheometrical values that give the end-user the ability to understand and monitor the “performance-ability” that these specially designed binders provide. Wright’s tire rubber modified SHRP binders can be incorporated into any hot mix system used throughout the industry. These binders work well with Warm Mix Technology, are compatible with RAP mixes and are completely recyclable. Wright’s tire rubber modified hot mix binders are polymer-modified asphalt cements that contain a minimum of 5% - 15% whole scrap ground tire rubber. Utilizing the TRMAC™ process, the whole scrap tire rubber is completely integrated into the asphalt cement prior to modifying with SBS polymer. The final product results in a homogenous, stable material that is shipped from the manufacturing terminal to the jobsite. Our tire rubber modified hot mix binders provide excellent adhesion and outstanding cohesive strength in the final product. They are singular in composition and resist the effects of aging and weathering. When incorporating these binders into the hot mix manufacturing and laying process, standard construction equipment designed to handle polymer-modified asphalt cements will complete the project satisfactorily. When you combine the ease-of-use, superb performance and incomparable stability over time, you will find that Wright’s tire rubber modified hot mix binders are a superior, environmentally-friendly alternative to conventional binders. 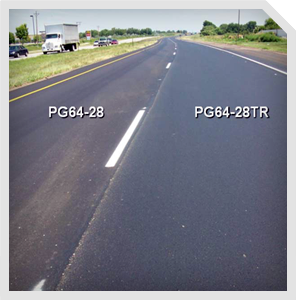 The PG64-22TR HMA contains 10% tire rubber that is modified with a SBS polymer creating a "hybrid" TR/SBS modified asphalt binder. The tire rubber component acts as a shielding agent when dispersed to a micron size providing added protection to the asphalt cement and SBS polymer from oxidation and UV degradation. This protection remains functional throughout the designed life of the mix..